This page makes finding information quick & easy. Just click the chosen skill, drill or topic and off you go to the source! "Our Feature Articles of The Month"
that coaches are looking for! Rundowns: Slam Dunks of Defensive Baseball by Coach Brian Priebe "The Baseball Coaches Page"
"The Right Equipment For The Job"
The Machine Considered by many to be the best home workout machine ever! The best tool on the market for strengthening and educating a thrower at any and every level! The best one-on-one coaching tool in baseball! Highly recommended for drills and pregame warmup. Most games are won or lost on the practice field. Winning comes from proper preparation and quality practice. 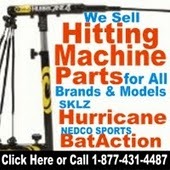 Give your team the best hit training equipment available today. For more information, click here!